In less than a week now the Holiday Catalog goes live! Some of you may have gotten yours in the mail already - if not, hop over to my store and create an account so I can send one to you!! 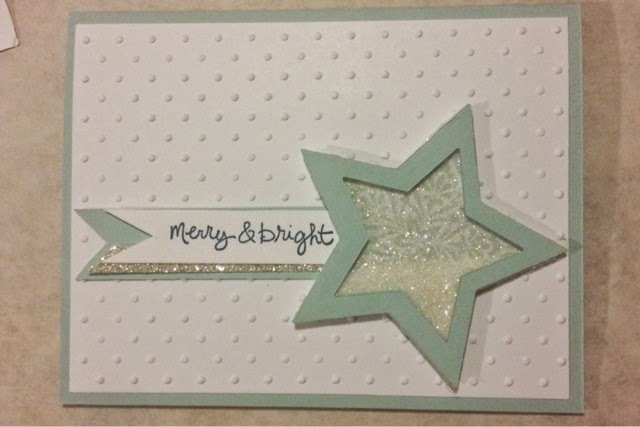 Here is a shaker card I made using the Star Framelits with the soon-to-be-released Bright and Beautiful star stamp set from the Holiday Catalog, and a sentiment from the exclusive Hostess Gift set Good Greetings! This set will only be available to my Hostesses, I'll have more info for you when the catalog goes live on how you can get your set! 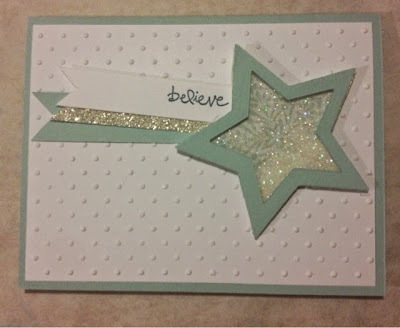 A shaker card has a built in layer that can hold confetti, or sequins, or glitter - here I used Dazzling Diamonds Stampin' Glitter. 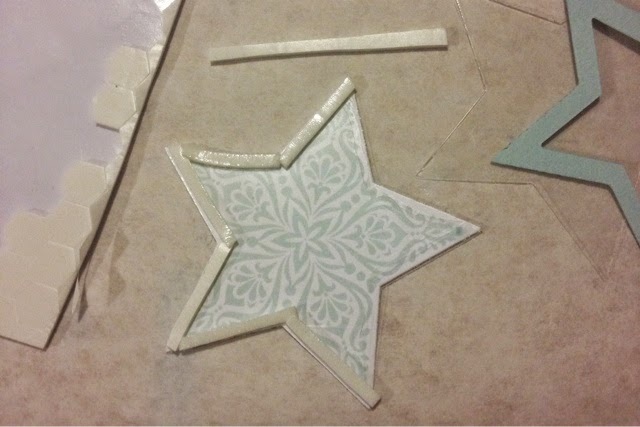 I stamped my star image (from the Holiday Catalog set Bright and Beautiful) and diecut a star from a piece of Window Sheet. I cut the very edge of my Stampin' Dimensionals sheet to get the straight edges enclosed on my star and create that window effect. I added the glitter, and placed the window sheet over the top. I then glued my Soft Sky star frame - cut with the nested star framelits - over the top and added the whole piece to my card. Here is another card I did the same way - just using a different sentiment from Good Greetings! This layout would also work with the Heart Framelits, or the Festive Flurry snowflake framelits, or... well, almost ANY of our framelits - there are a bunch of nested shapes like this! Take a look HERE. I think this would be a good embellishment for a bag tag or a scrapbook page too. Kind of fun! The holidays will be upon us before you know it - let me help you with your party decor or card giving needs! And, stay tuned for the special offer for Hostesses!